ARSENAL Ladies hot-shot Lianne Sanderson lifted the golden boot for the National Division on Friday at a glittering FA Women’s Awards ceremony at Vinopolis near the South Bank. The 20-year-old won the leading scorer mantle for the second year running after knocking 25 goals past her league opponents this season. 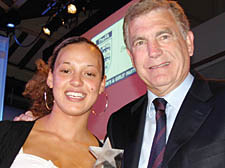 Sanderson, in her 10th year at Arsenal, bagged 50 goals in all competitions and was congratulated after the ceremony by former England and West Ham star Sir Trevor Brooking (pictured). Her Arsenal colleagues Karen Carney and Alex Scott were in the running for players’ player of the year, but were pipped at the post by Everton midfielder Jill Scott.